My daughter loved this. She said, it was almost like an optical illusion for food. In the middle of assembling the adobo, I spied the can of coconut milk in the cupboard. We love anything with coconut milk! And I have seen adobo recipes online where they add coconut milk. So I thought, we’ll give it a try. Then when I was pulling out some bay leaves from the spice cabinet, there was that jar of turmeric just begging for attention. So what the heck, I just read about the health benefits of turmeric, I pulled it out too. But she and the rest of the family all agreed that it was actually pretty darn good! 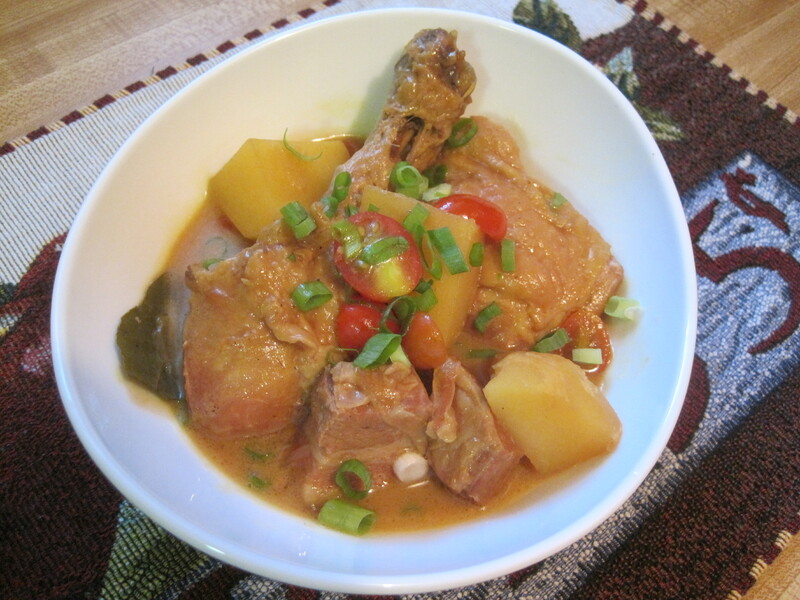 This is a variation of the usual pork and chicken adobo. Since we're using pork and chicken and they require different cooking times, start by giving the pork a head start. Place the pieces of pork into the pot and add 3 cups of water. Cover and bring to a boil. Let the pork cook while you're preparing the rest of the ingredients (about 30 minutes) or until most of the water has evaporated. Once the water in the pot is almost evaporated and the pork is starting to sizzle, add half of the ginger, garlic, onions and bay leaves. On top of that, layer the chicken pieces and add the rest of the onions, garlic and ginger on top. Pour in the soy sauce and vinegar. Then the coconut milk. Pour 1 cup of water in the empty coconut milk can to rinse out the remaining bits and pour that water into the pot as well. Add the black pepper and turmeric and cover. Let it come to a boil and turn the heat down to medium low heat and let it braise for an hour or until the chicken is tender. Add the potatoes and cook for another 15 minutes until cooked through. 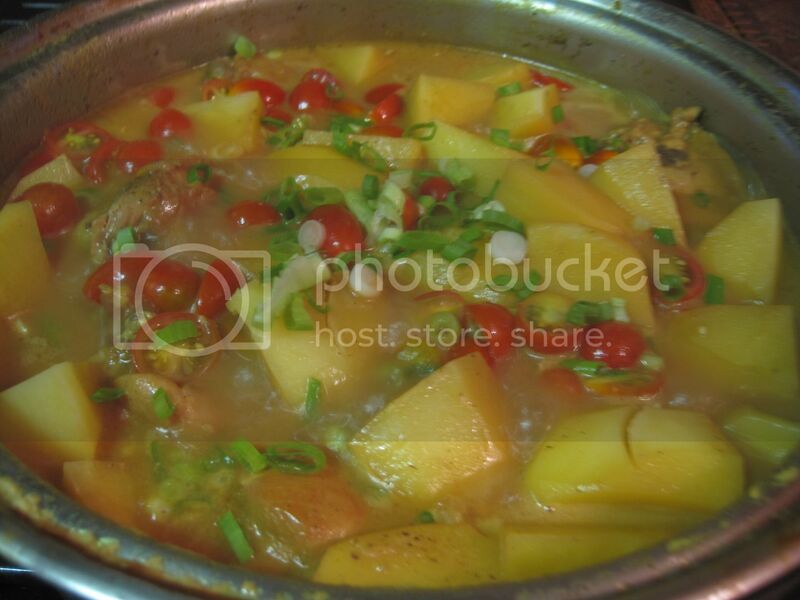 Add the tomatoes when everything is cooked and just before serving. You don't want to cook the tomatoes, just warm them up for a minute or two. Sprinkle with scallions before serving. – the addition of tomatoes and scallions is optional. I just happened to have some really sweet grape tomatoes from the garden and it paired perfectly with this dish, adding a very pleasant sweetness to contrast the acidity in the adobo. 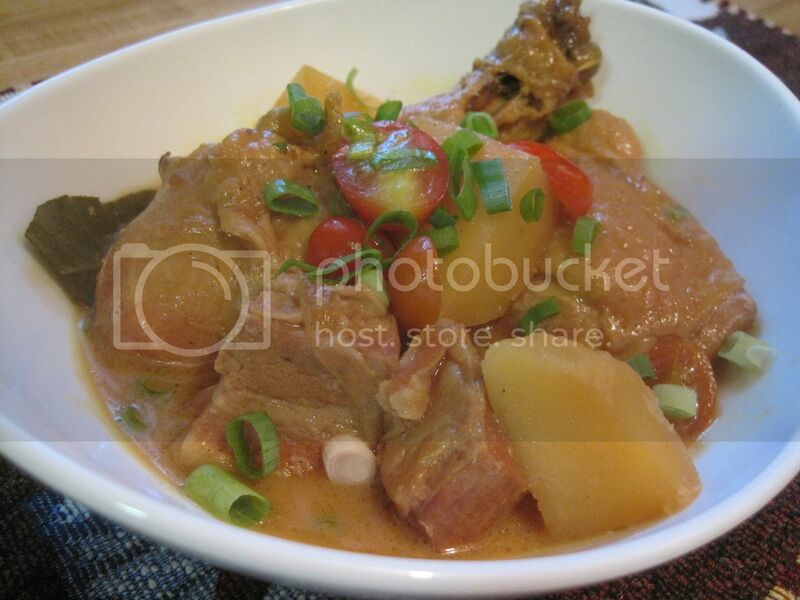 – traditional adobo dishes were actually cooked to be on the dry side. Some people even go as far as frying the meat after braising in the sauce. However, since some people in my family love to drown their rice in adobo sauce and will resort to pouting when there isn’t enough sauce to go around, I have taken to making my adobo dishes on the soupy side. If you prefer a less soupy dish, I suggest omitting the water and cutting the soy sauce down to 3/4 cup then let the remaining sauce to cook down by letting it boil uncovered for a few minutes towards the end of your cooking time. Dexie, turmeric had really good health benefits (especially for older men – ahem… don’t let him hear me say that)so I have been trying to sneak it in as often as I can. lol!